Revisions and wages command the attention from the August jobs report. The headline is 201k while the private sector added 204k as government got smaller again. This is a solid report, but it did cool from the unsustainable pace set by the last several months. The key areas of Labor Force size, Participation Rate, Total Employed and Not in Labor Force totals lost a little ground. That coupled with a net 50k in downward revisions to the prior two months shows a bit of a return to earth, at least for August, but this data in no way suggests any slowing in the economy at large. The number of those at work part-time for economic reasons is way down again and those part-timers for non-economic reasons is up again. The Diffusion Indexes are still over 50 even with a drop off in manufacturing jobs, and the Private Sector totals are still averaging over 200k for the year in spite of the oversized downward revisions. The big news, however, comes from wages. 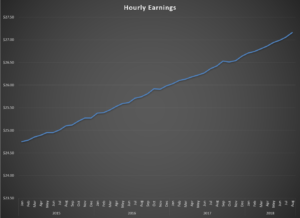 Last month on WBBM’s Noon Business Hour Matt was asked about wage pressure if we are indeed near full employment. He predicted it should start to show up soon, and here it is! At .4 and 2.9 percent month over month and year on year, respectively, these handily beat estimates, and we can already hear the hawks’ wings beating the air. It will be difficult for the Fed to keep their fingers off the volume, so we see a good chance of another hike at the next meeting. 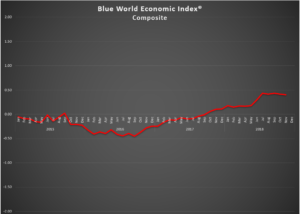 The Blue World Economic Index® posted earlier this week and we’ll see you back here at the end of the month. Have a great September 2018. Job growth for the private sector continues to advance at an impressive pace. Even though the headline says 157k, the Private Sector grew by 170k as government got smaller by 13k payrolls. Add to that upward revisions to May and June of 59k and we’ve got a really hot labor market! 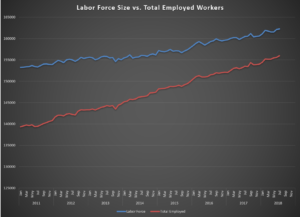 Today’s graph is the Size of the Labor Force vs. Total Employed Workers, and it shows a decidedly expansionary pattern. Review this and our post “A Flute with No Holes is Not a Flute and a Recovery with No Jobs is not a Recovery” from 2012, and you’ll get a very good visual comparison. The Labor Force grew by 105k, Total Employed grew by 389k and Total Unemployed fell by 284k. The Participation Rate remains stubbornly below 63% at 62.9%, but the Diffusion Indexes show expansion in all private sector industries, including manufacturing, and not by a little. Remember, 50 is a break even on expansion. Both of these are holding in the mid-60’s. The bellwether sectors of Manufacturing and Construction had another winning month, and part time workers for non-economic reasons are being hired at a break-neck pace (228k) in a mad dash to satisfy backlogs. The importance of that cannot be overstated. Wages grew, but probably not enough to spook the hawks. That’s good. We still don’t believe inflation is a realistic threat to the expansion right now, and prophylactic moves to “head it off” are ill advised. The jobs report is corroborated by the balance of economic reporting over the past month, including GDP. 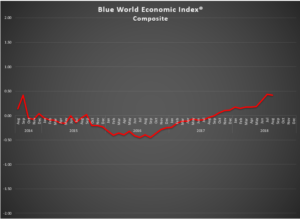 You can get a broader look at the economy at the Blue World Economic Index® report which posted earlier this week. So far, so good in 2018. Expansion is the name of the game. Go for it with the right hand, but always keep the left hand near the brake with a watchful eye on the economy through us! Matt is on real time today at 12:05p C on WBBM in Chicago to break it down live on the Noon Business Hour, AM780/105.9FM. If you miss it live you can get the Podcast later today. The next jobs report is scheduled for September 7th. We’ll see you then. Have a great August!